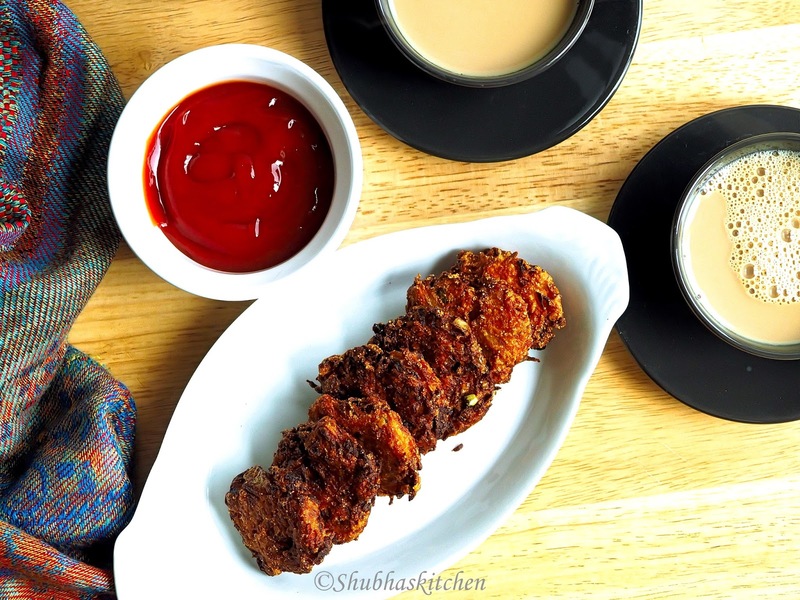 The key to making the perfect vadas is the correct amount of besan to be used. The amount of besan should be just enough to bind the carrots and help make you balls. 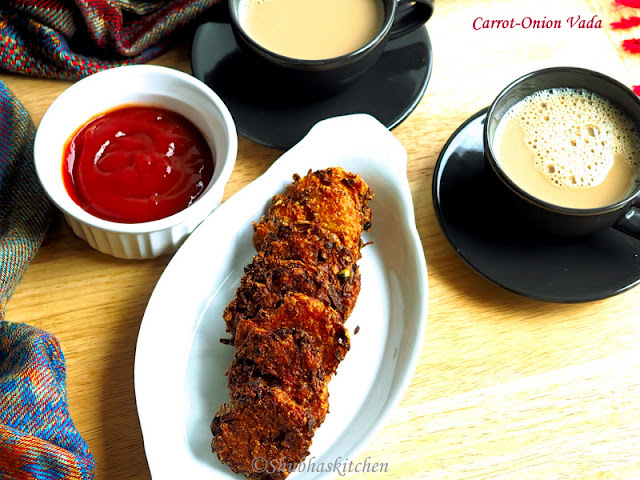 Also remember that if you use more besan ,the carrot- onion besan mixture will be thick and dry and vadas will not have the right flavor. 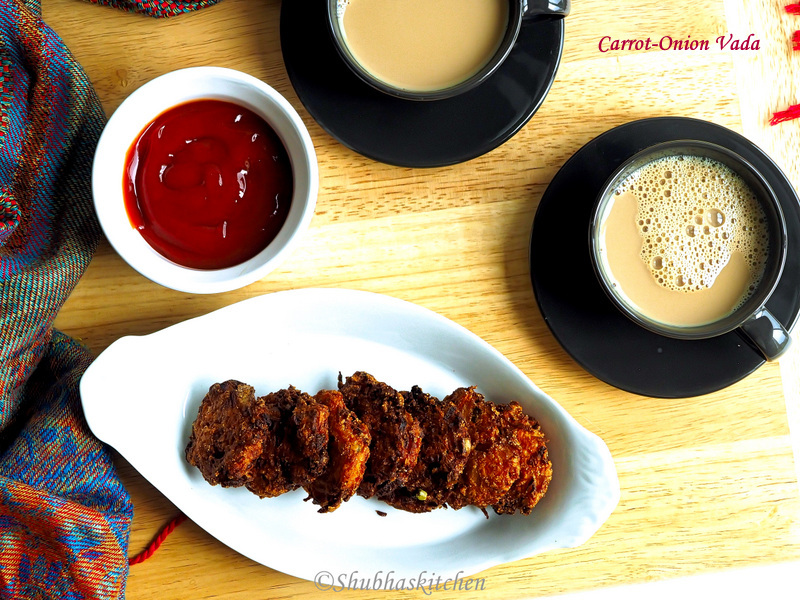 Also add the rava just before putting the vadas in to hot oil. 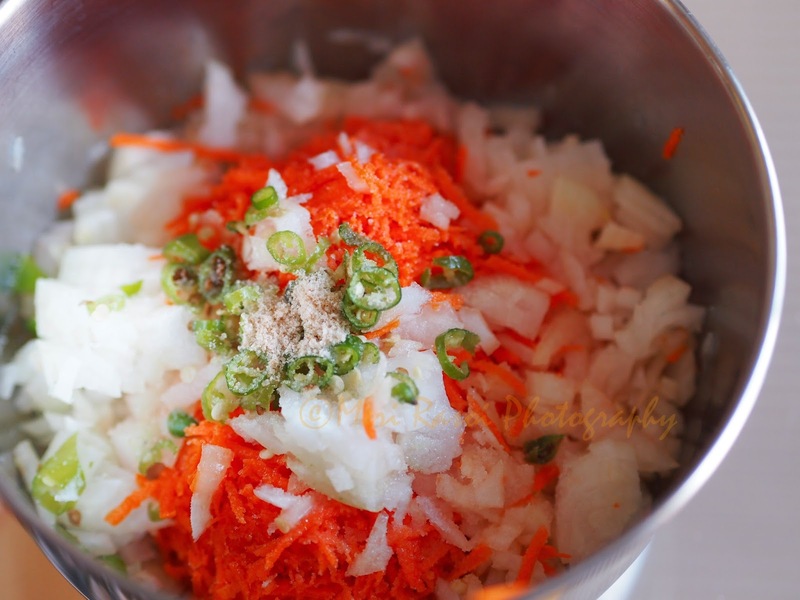 Mix carrots and onion and sprinkle the salt.Add the chopped green chillies and hing. Now add the besan or the chick pea flour little by little just enough to aid in the binding process and help you make the carrot onion balls. When the consistency is just right, add the Semolina and give one final mix. Heat some oil in a pan for deep frying. 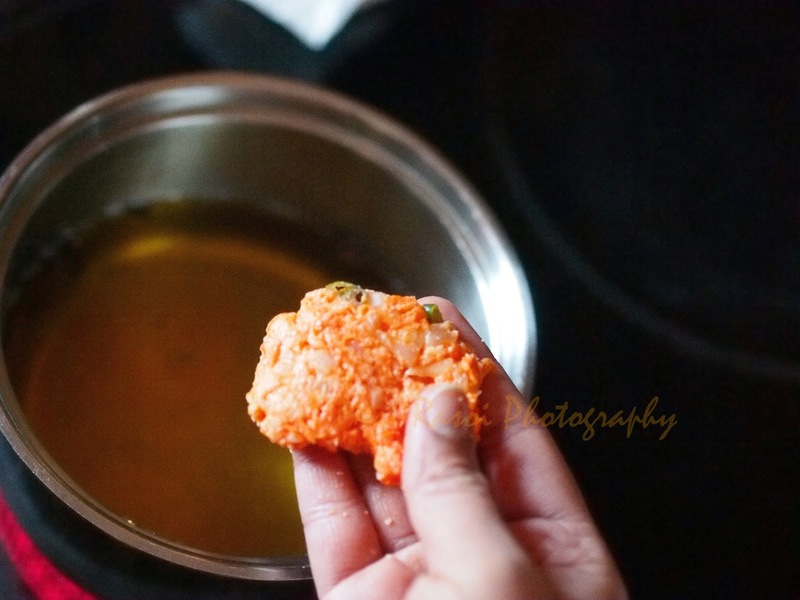 When the oil is hot,make balls from the mixture and then flatten them to make thin flat vadas and drop them in the oil. Fry them .Note: I like to make thin vadas or fritters because they cook faster that way. Once done, remove the vadas/fritters from the oil and place them on a plate lined with paper towels to drain off the excess oil. Do not leave the carrot onion mixture out for along time as the carrot and onion will leave water and the mixture becomes watery. You can use appropriate amount of red chilli powder if you are not so keen on using the green chillies. 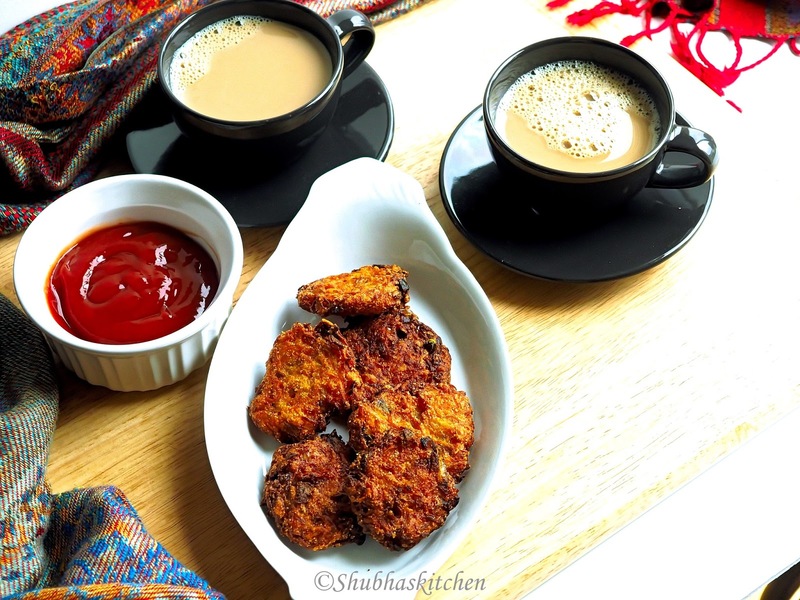 Do not keep the flame or heat too high while frying or else the vadas or fritters will get browned too fast but the inside will still be uncooked. Crisp n nice vadas! Nice idea to add carrots! I've been very inspired by your blog and try and cook more traditional things at home for my son now. Made these vadas when my parents in law stayed one wknd and it was a cold, grey afternoon - everyone loved it! Pakoras look so crispy. Would love to try it soon..